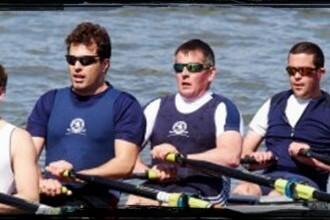 Henley Rowing Club competed at its own event with a complete cross section of the club taking part from under 14 junior boys through to Masters. The Club recorded five wins, making it the most successful club of the day: Open Junior 16 coxed four, Open Junior 14 coxed quad, Women’s Junior 15 coxed four and Women’s Junior 18 coxed four in the morning followed by Women’s Junior 14 coxed quad in the afternoon. The WJ15 girls squad continued its winning streak. 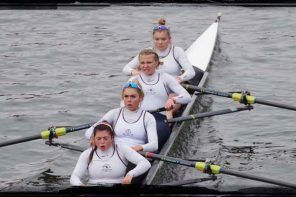 Emilia Fulford Dobson, Della Luke, Holly Thompson, Darcy Smith and cox Maddison Sturgess had limited opposition and won the event comfortably but their time was quicker than the winners of WJ16 4+ and both Bands 2 and 3 of the senior women’s events. 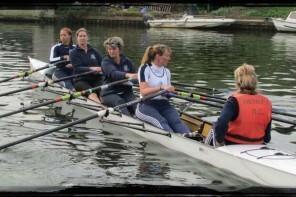 In the afternoon the girls where joined by Georgie Pollard, Ava Reineke, Poppy Wilson, and Holly Cookson to compete in the Senior Women’s Band 3 open 8s event as there was no other J15 entries. A creditable performance saw them finish second in their category, and strong enough to beat another 18 senior women’s eights from clubs and colleges from across the country. For the WJ14 girls it was the first time they were racing big local opposition from Headington School in Oxford, who brought four crews in a division of 11. The WJ14 crew of Natalie Schoenmakers, Laoise O’Donohue, Mia Roullier, Bea Bethell and cox Daisy Rolstone powered over the coarse to win by an impressive 57 seconds. The J14 boys coxed quad of David Wallace, Zac Charles, Olly Deacon and Jamie McLellan with James Oldham as cox were finally able to race and enjoyed an emphatic victory over their opposition, overtaking the crew ahead by Temple Island and drawing away from the field throughout the race. The weekend also saw Henley Rowing Club’s older juniors taking part in the second round of trials run as part of the selection process to represent Great Britain at International competition later this year. Six girls, Georgie Robinson Ranger, Lottie Orr, Issy Jonsson, Mary Wright, Daisy Butterworth and Maddy Pollard were taking part in the J18 events and Charlotte Rowley, Georgia Brown and Carla Russell the J16 events. On Saturday in the single sculling trial Georgie finished 1st and Lottie 3rd with Issy and Mary also finsishing in the top 20. Charlotte Rowley finished in 5th in the J16 event. On Sunday the girls were put into double or pairs by the selectors. Georgie and Lottie were paired in the double and were the fastest double and in the J16 event Charlotte and Carla were a selected double and finished second. These performances put the girls in a strong position for the future trials and hopefully selection later in the year. The boys also performed well at trials with three J16 boys in the top 20 of 42. Henley Rowing Club was the only club or school having three placed being Ed Roy, Seth O’Connor and Grant Taylor.